Sassool Mediterranean Cafe will be offering “Treat and Sweet” packages to celebrates Valentine’s Day this year! They will also be featuring a special “Sweetheart Salad” for the month of February. Packages are available beginning on February 4, 2018 and the salad will be offered beginning February 1, 2018 at both Sassool locations in Cary and Raleigh, NC. The “Treat and Sweet” packages are all gluten-free and highlight a few of the delicious items that can be found in the Sassool grocery section. With three different options, Sassool’s “Treat and Sweet” packages are the ideal start or finish to a lovely Valentine’s Day with your significant other or your group of friends. 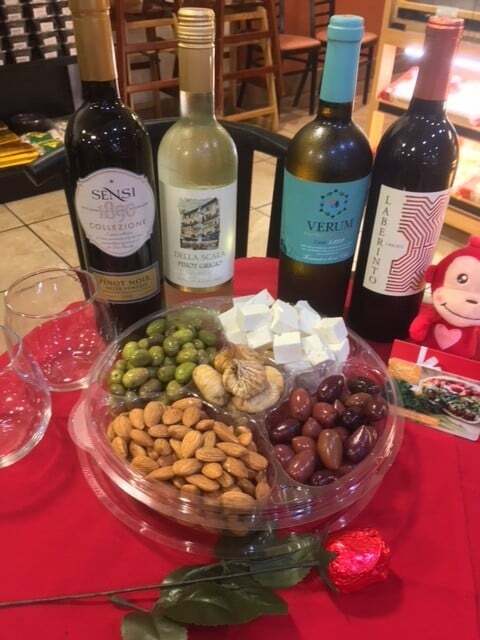 All options feature gourmet items and offer the add-on of a bottle of Mediterranean wine with the purchase. 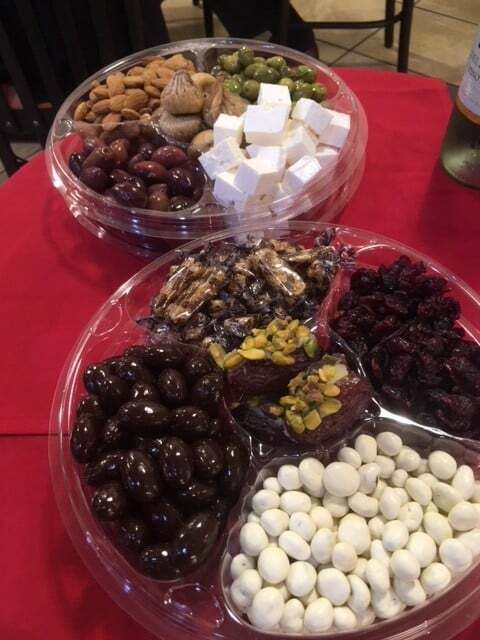 Treat + Starter Variety Pack: This variety pack includes kalamata olives, green Lebanese olives, bitesize feta cheese, roasted almonds, and dried figs. Sweet Variety Pack: This variety pack includes dark chocolate almonds, yogurt covered raisins, sesame crunch candy, dried sour cherries, and mascarpone stuffed dates. 1 Treat + Starter Variety Pack, 1 Sweet Variety Pack, and 1 bottle of Mediterranean wine. For $15, add your choice of Mediterranean wine to any package above, from a choice of four bottles. Options include: Cheval Quancard Merlot, Carmenet Cabernet Sauvignon, Della Scalla Pinot Grigio, or Jean Bousquet Chardonnay. The Sassool “Sweetheart Salad” features beautifully colored ingredients with purples, pinks, and reds. It is every bit delicious as it is beautiful with red corn, purple cabbage, red onion, pomegranate seeds, red bell pepper, parsley, lemon juice, olive oil, and herbs. The salad is $9.99 per pound and will be available in the cold cases at both Sassool locations. Sassool Mediterranean Cafe is family-owned and offers homemade fresh Lebanese and Mediterranean cuisine in a fast-casual setting with locations in Raleigh and Cary. The Sassool brand was launched on Mother’s Day, May 11, 2014 to honor the owner Mounir Saleh’s mother, Cecilia, for the authentic recipes that she brought with her when she immigrated from Lebanon with her family to Raleigh in the 1970s. The name of the restaurant, Sassool, is the nickname that Cecilia was called by her father when she was a child. Sassool is located at 1347 Kildaire Farm Road, Cary, NC 27511 and 9650 Strickland Road, Raleigh, NC 27615. A third location will be opening in Spring 2018 at the Morgan Street Food Hall and Market! Escazu scores Good Food Award! 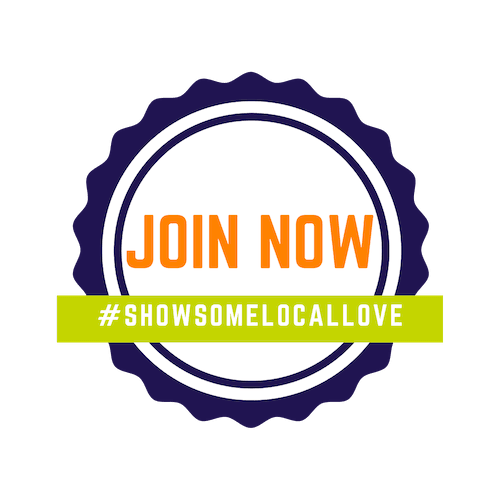 2018 Annual Member Meeting Tickets!